Firewalls prevent all access to your database server until you specify which computers have permission. The firewall grants access to the server based on the originating IP address of each request. To configure a firewall, create firewall rules that specify ranges of acceptable IP addresses. You can create firewall rules at the server level. Firewall rules: These rules enable clients to access your entire Azure Database for MySQL server, that is, all the databases within the same logical server. Server-level firewall rules can be configured by using the Azure portal or Azure CLI commands. To create server-level firewall rules, you must be the subscription owner or a subscription contributor. All database access to your Azure Database for MySQL server is by default blocked by the firewall. To begin using your server from another computer, you need to specify one or more server-level firewall rules to enable access to your server. Use the firewall rules to specify which IP address ranges from the Internet to allow. Access to the Azure portal website itself is not impacted by the firewall rules. Server-level firewall rules apply to all databases on the Azure Database for MySQL server. If the IP address of the request is within one of the ranges specified in the server-level firewall rules, then the connection is granted. If the IP address of the request is outside the ranges specified in any of the database-level or server-level firewall rules, then the connection request fails. To allow applications from Azure to connect to your Azure Database for MySQL server, Azure connections must be enabled. For example, to host an Azure Web Apps application, or an application that runs in an Azure VM, or to connect from an Azure Data Factory data management gateway. The resources do not need to be in the same Virtual Network (VNet) or Resource Group for the firewall rule to enable those connections. When an application from Azure attempts to connect to your database server, the firewall verifies that Azure connections are allowed. There are a couple of methods to enable these types of connections. A firewall setting with starting and ending address equal to 0.0.0.0 indicates these connections are allowed. 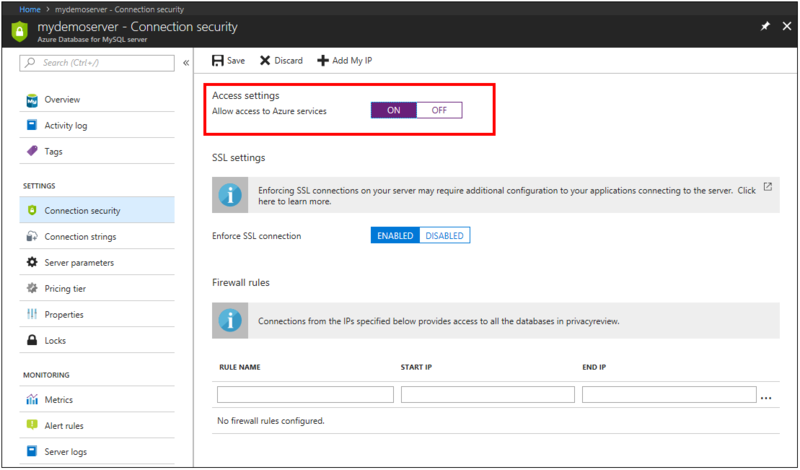 Alternatively, you can set the Allow access to Azure services option to ON in the portal from the Connection security pane and hit Save. If the connection attempt is not allowed, the request does not reach the Azure Database for MySQL server. Changes to the allow list have not taken effect yet: There may be as much as a five-minute delay for changes to the Azure Database for MySQL Server firewall configuration to take effect. The login is not authorized or an incorrect password was used: If a login does not have permissions on the Azure Database for MySQL server or the password used is incorrect, the connection to the Azure Database for MySQL server is denied. Creating a firewall setting only provides clients with an opportunity to attempt connecting to your server; each client must provide the necessary security credentials. 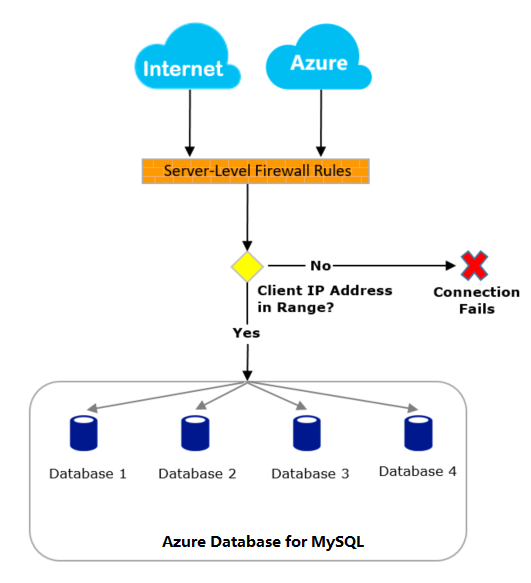 Ask your Internet Service Provider (ISP) for the IP address range assigned to your client computers that access the Azure Database for MySQL server, and then add the IP address range as a firewall rule. Get static IP addressing instead for your client computers, and then add the IP addresses as firewall rules.